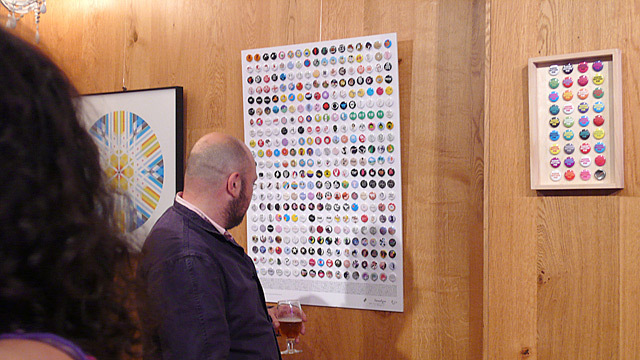 The A1-sized poster FL@33 designed especially for the Badge Button Pin book launch exhibition credits all individual contributors ever commissioned for Stereohype's growing design collection. 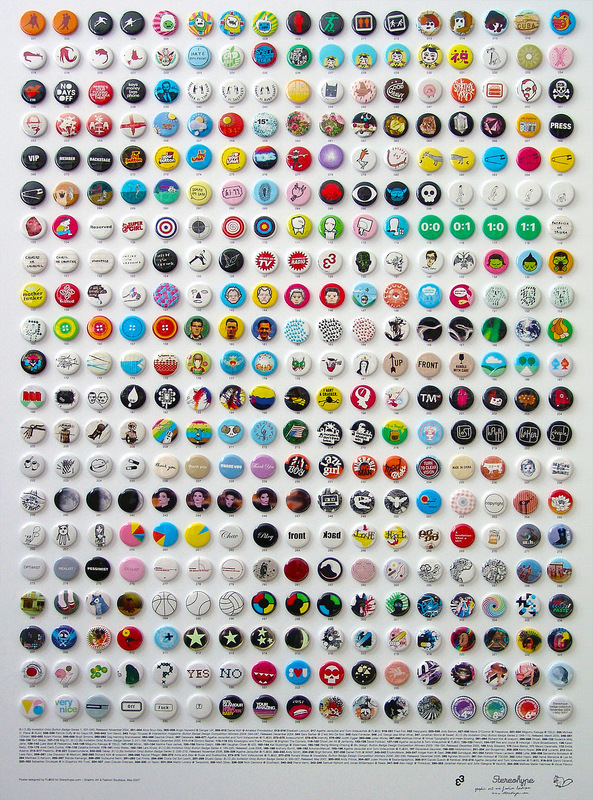 All 356 button badges created for FL@33's sister company between October 2004 and May 2007 were literally pinned onto foam board. 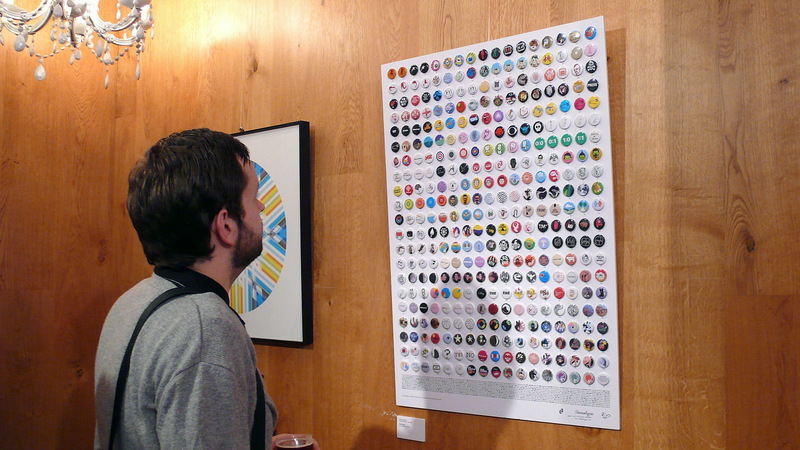 ___ The book launch exhibition was held in London and featured badges from around the world and other badge-related projects. ___ Badge Button Pin includes a dedicated Stereohype section featuring our growing collection until B.I.O. (by invitation only) series 4 and the 2005 edition of Stereohype's annual button badge design competition. 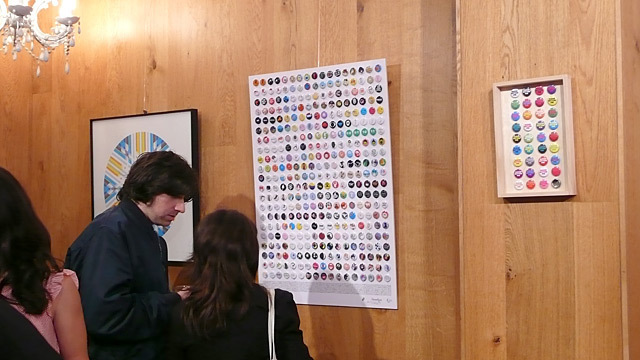 We were pleased to be able to exhibit even more Stereohype badges during the book launch. The limited edition version of the book is packaged with a set of 10 real button badges especially designed for the book – by Alexander Gelman, Michael C. Place (Build), FL@33, Antoni & Alison, Trevor Jackson, Mark Pawson, Fred Deakin, Kim Jones and Femke Hiemstra (Femtasia). Badges, buttons and pins have been around for over a century. Today they're everywhere: on lapels and bags all over the world and in the sketchbooks and on the screens of some of the hottest graphic designers, artists and illustrators. ___ A badge can be a cheap and easy way to display political or cultural affiliations or it can simply be a fashion accessory. Cheap to produce and easy to make at home, the humble badge is the new T-shirt. ___ A guide to the best and most beautiful badges being produced right now - be they graphic, textual or plain illustrative - this book explores the rich variety of uses of the badge since the year 2000 – whether it be promotion, revenue-raising or simply decorative. It will appeal to graphic designers, illustrators, fashion designers, artists, music lovers and badge enthusiasts of all ages. From top to bottom, left to right – pictures 1, 3, 4, 5 and 13 taken by Leo Cackett – shown here with kind permission of Gavin Lucas who posted them over at the project's myspace.com page at the time. All other pictures by FL@33.